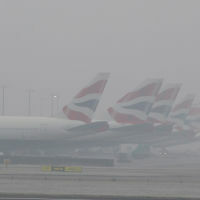 Hazardous weather conditions and low visibility is impacting airports across the UK, causing delays and cancellations. Freezing fog and widespread frost has affected around 100 flights at Heathrow, with London City cancelling 37 flights, the BBC has reported. Gatwick has only cancelled one flight so far, although has issued a warning that delays are likely. Meanwhile, Stansted Airport in Essex and Luton Airport in Bedfordshire are yet to cancel any flights. Taking out holiday cover at the time you book your trip provides added protection if your flight is cancelled. Dense freezing fog patches prompted the Met Office to issue a yellow "be aware" warning for the south, including London. It is also warning of hazardous conditions in the east of England. Forecaster Steven Keates said the hazardous conditions would impact some travel on Monday, warning there is likely to be difficult driving conditions and delays at some airports - including the London airports. Mr Keates said: "If you have got an early morning flight it might be worth double checking, just to make sure there are no delays at the airport." Parts of Essex and Hampshire saw temperatures drop to as low as minus 8C over the weekend, the Met Office said. Northern Ireland, parts of Scotland and northern England were also expected to see temperatures plummet as the freezing fog shifted north, starting the week with a "sharp frost". More time will be needed when setting off for airports as bitterly cold temperatures and a blanket of frost create slippery driving conditions. Speaking to the Guardian , Simon Partridge, a meteorologist at the Met Office, said there would be a slow clearing process and persistently bitter temperatures means some parts are not likely to see the freezing fog shift fully. He said: "Again, tonight we're looking at fog in some places, which is likely to form quite quickly when the sun goes down. It could actually be even further spread, into the Vale of York and Wales."